INDUSTRY.co.id - Tangerang - Property developer, PT Sunny Garden Property is working on its inaugural project in Indonesia. 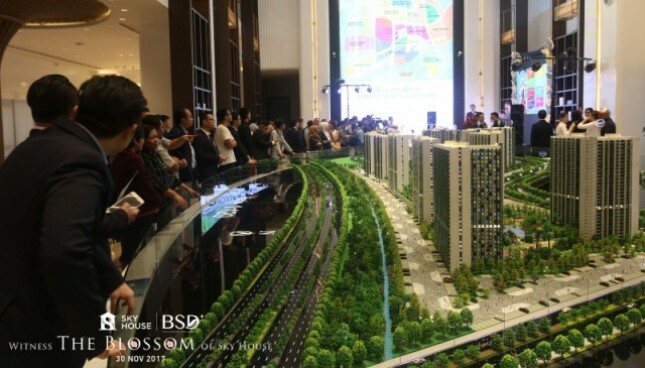 It will build 12 apartment towers on an area of ​​8.3 hectares located adjacent to the shopping center AEON Mall BSD City. "The location of BSD Sky House is strategic and premium, right next to Aeon BSD Mall, the primary location where there are various public facilities such as shopping centers, education, health facilities, are easily accessible from every corner. The area is growing rapidly with a high price increase annually, "said Sky House BSD + Marketing Manager, Sunny Garden Property Aruna Hidayat in the launch of Sky House Theme Park and Club House facility, in Tangerang, Thursday (30/11/2017). Type of units available at BSD Sky House ranging from studio type (20 m2), 2 bedroom (46 m2), 3 bedroom (66 m2), 3 + 1 bedroom (85 m2) and 3 + 1 bedroom ( 111 m2). As quoted from the old BSD Sky House for the initial price of BSD Sky House apartment from Rp450 million, with installments up to 36 x and KPA, NUP only Rp 2 million and fully refundable if canceled take the unit when the election is held. He adds, Skyhouse BSD comes with the concept of Singapore life to BSD City which emphasizes the elements of nature, landscape, architecture, entertainment and the presence of the international community that makes you feel like life in Singapore. Skyhouse BSD is equipped with children's play area, 1.2 km jogging track, yoga area, badminton and tennis courts, tropical garden, adult swimming pool of 1,600 m2, a 500 m2 children's pool and gymnasium inside and out building.